In the Military Museum of Kalamata in the capital of Messinia under the supervision of the Joint Chiefs of Staff there is the newest Greek history since 1821 to the present day through texts, photographic and audiovisual material of the army. The tour of the Military Museum of Kalamata starts with uniforms and war material and the War of 1821. Then we continue with the Macedonian Struggle, with exhibits and reference to Messinian Macedonian warriors. Then exhibits for the Balkan Wars are presented. A large section of the exhibition is devoted to the Asia Minor Catastrophe. There are references to the First and Second World War, the battles of Ochura and Crete, the Middle East and the National Resistance. 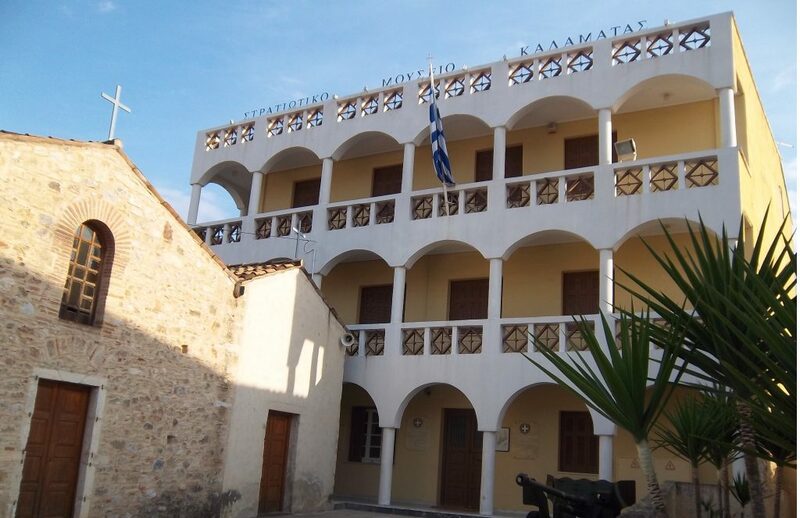 The Military Museum of Kalamata also refers to peacekeeping missions of Greek army. In the specially adapted room “Sound and Light” of Military Museum of Kalamata there is a film about the history of the 9th Infantry Regiment, while an important part of the exhibition is the book of Messinian dead people who fell during the struggles since 1897 to 1974. In the courtyard of the Military Museum of Kalamata you will see a chariot M48-A5, an M8 armored vehicle , guns and an aircraft F-5. The Military Museum of Kalamata is closed on Mondays. Entrance is free.